We successfully made it through our first discussion of a silent film! It's a little ironic that we started with what some consider the final film of the silent era, but perhaps it only made it that much more accessible. Josh and I discussed our experiences watching the film, how Chaplin approached the use of sound in the film (yes, silent film is a bit of a misnomer for this one), continued our discussion of man's relation to the machine and progress, and how to keep hope amidst terrible circumstances. For those of you who missed out, this film is definitely worth a watch. 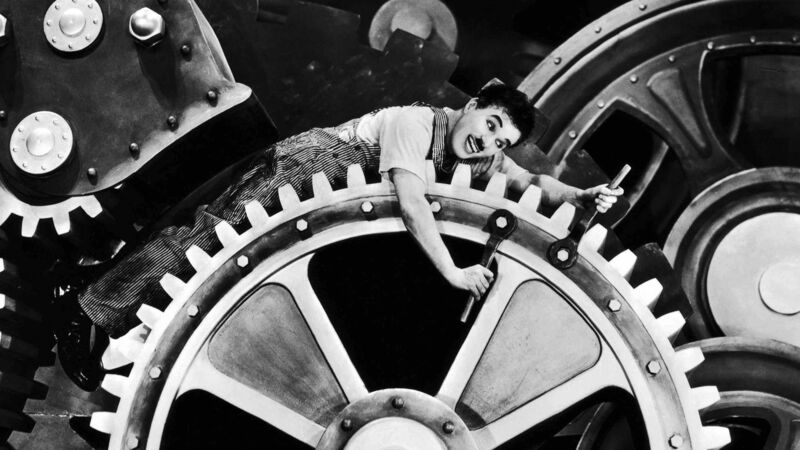 Overall, Chaplin seems to be drawing a connection between his awareness of the Tramp’s obsolescence—and, potentially, his own—and fears about the mechanization of modern life and its potential for crushing the common man, whom the Tramp has come to symbolize. His apprehensions are writ large in Modern Times, transmuted from a lone filmmaker to all of humanity: it is the machine that is mankind’s true opponent, deadening the senses and twisting flesh into steel. Skip to 1:09:10 to get to the section on the film.